If you wish to see it before your eyes have no fixed thoughts for or against it. 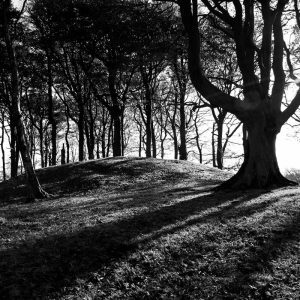 In brilliant low autumn sunshine I make the journey to the De’il’s Plantin, the Devil’s Plantation, or as it’s rather more prosaically known, Bonnyton Mound, off the Humbie Road, roughly seven miles south of the city between Newton Mearns and Eaglesham. I take with me: a flask of coffee, a high-definition video camera and a 1:25,000 Ordnance Survey map. After months of musing, reading and procrastinating, finally I’m on a pilgrimage. The Devil’s Plantation is a mound, a tree-topped tumulus – beeches mainly – that to my eyes don’t look older than say, 50, maybe 70 years. What was here before, I wonder? Who was here before? Are there really dead people under my feet? Even Harry can’t tell me how the place acquired its name. Researching, all I’ve come up with is a couple of historical references, a photo on Flickr showing a likeness of Satan himself in a cloud formation taken at the site (at midnight) and an unsubstantiated claim that the site is haunted. Not much to go on, or so I thought. Then I had a huge piece of luck. Shortly after it was announced that I was creating a work based on retracing the ancient paths of Glasgow, I received an email from Grahame Gardner from The Geomancy Group. A few months ago Grahame very generously forwarded me a Google Earth file listing all of Harry’s sites (plus a few of his own) from the Glasgow Network of Aligned Sites and also Harry’s Forgotten Footsteps, a wider network of alignments across Scotland. After a bit of jiggery pokery, I managed – with excitement – to open the file and there they were, all laid out. I was glued to the screen for days afterwards. Sooner or later though I knew I had to get out in the field and get my hands dirty. If you fly into Glasgow from the south or south-east on a clear day, you can see that the city lies in a vast hollow more or less encircled by barren hills and plateaux. The River Clyde flows north-west through this hollow, and though it widens to an estuary before turning south there is no steady widening and flattening of the landscape as the river moves towards the firth. To reach the hollow otherwise than by sea from the west or across the low watershed that divides it from the Forth Valley (a route apparently not favoured in prehistoric times) the earliest settlers in the region would have had to seek out the passes, of which the most obvious was the Biggar Gap, a natural route from the North Sea coast between the Tweed and Clyde Valleys… As the first inhabitants of Scotland, stone-age hunters and fishers, pushed up from the south in the wake of the retreating ice age, something over six thousand years ago, they must have found the region thickly wooded. It was not until the arrival of the second group, stone-using agriculturalists growing cereal crops and with domestic animals, that a start would have been made in clearing the forests and that parts of what we might call the Glasgow hollow were settled, however sparsely. It was these alignments Harry set out to find. To do this he needed a mark point, a stone or a mound and for reasons unknown, chose this place. But I’m not alone – or so I found when I dodged an almighty cowpat. Looking up, I see a herd of cows looking back at me with bemusement. At first glance the mound is nothing remarkable. At the top are two shallow indentations, like the imprint of a giant’s backside. 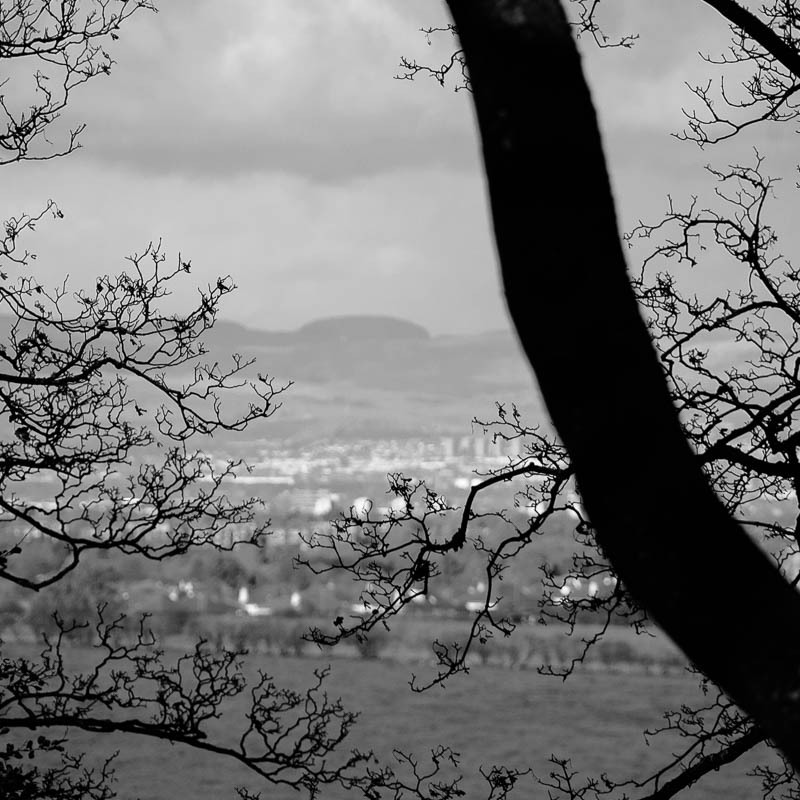 I sit between them, overlooking the A726. Now is the right time of year to be here; the summer foliage has receded and the land is laid bare. 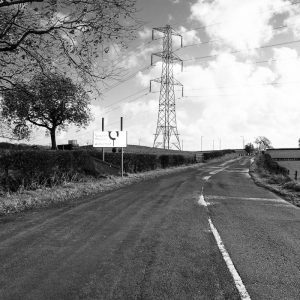 You see it in the patterns in the landscape, the existing roads, the old straight tracks. Having plotted the mound on his map, Harry discovered a strange thing, that on the map, the De’il’s Plantin, Mearns Castle and Crookston Castle fell into rough alignment. But heeding old Alfred, he knew that three points did not prove a ley. He needed a minimum of four sites. By extending the line beyond Crookston Castle, he found it passed through the grounds of Renfrew Parish Church, giving him the four sites needed to conduct further field work. Crookston Castle I’m well aware of. Growing up in Pollok in the south-west of Glasgow in the 60s and 70s, I saw it looming in the near distance every time I was sent on errands to the post office in Lyoncross Road. Even the local secondary school attended by my sister and two brothers is named after it. So when I first discovered Harry’s writings I was struck by his reference to it as a significant site, a piece of magic, right on my own patch. (Crookston Castle) is surrounded these days by a council housing estate though its hilltop position means that it has grassland around it. How very inconsiderate of all those council-house dwellers. Like Crookston Castle, the De’il’s Plantin boasts fantastic views. 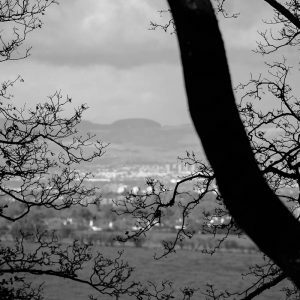 Reading Harry’s account, I learned that the map suggested a direct line from the mound to a distant hill, Duncolm, in the Kilpatrick Hills. Now what I know about grid bearings isn’t worth knowing, but I have excellent eyesight, so scanning the horizon north, when I caught my first-ever sight of Duncolm a palpable thrill ran through me. Looking at Google Earth may be useful, I thought, but the idea of tracing these alignments and recording them from my five feet four perspective on the world is more of an adventure. I have tried without success to buy a copy of Harry Bells book. I have however read it( or extract from it) online however there were no plans or maps. Can you advise where I could get a copy of the plans detailing the aligned sites? Harry’s book has been out of print for years. I tried to get a copy but with no success. I did eventually get a photocopied version from Dr. Ronnie Scott. This link may be useful because it contains the text of the book and illustrations of some of his alignments. Many thanks for putting up the link and for quoting my blog – I’m always grateful for a mention! I’ll check out your other link too. I think you’ll find you get more than one mention in this blog! Sorry for not posting your other comments under my most recent post on the Cochno Stone. They’re a wee bit off-topic for that particular post. If you’ve read some of my other posts you’ll know I began this project in 2007 and at the time I did a lot of research, some of which crossed paths with the sources you mention. The Knights Templar and associated topics are fascinating but they’re not a on the spine of Harry or Mary’s stories so I didn’t delve too deeply. No problem at all about the comments May, I realised they were off topic but I was just looking for somebody’s guidance as regards that codes blog because I got a bit freaked out myself. I shall be in touch. Your replies are much appreciated.